A sunny weekend in April was perfect to spend some time in the woods, picking up a very old skill. 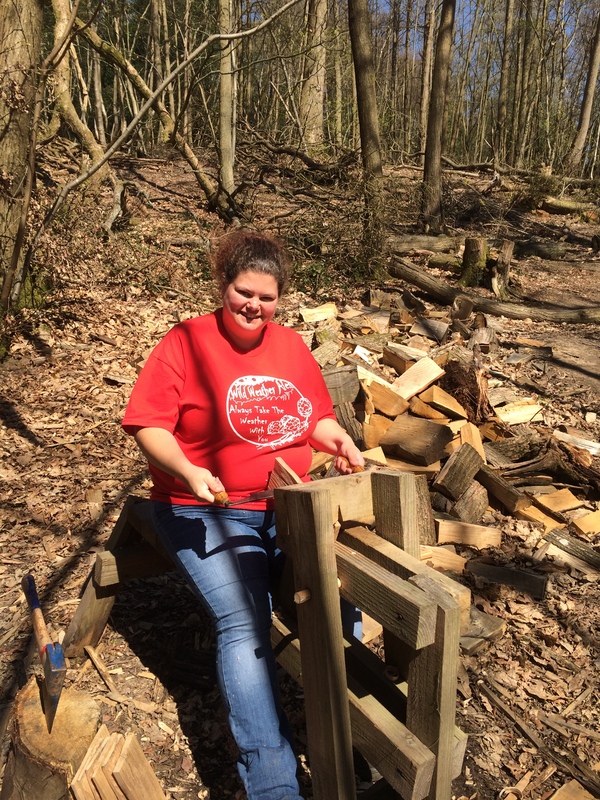 I volunteer regularly with the London West Middlesex National Trust Volunteers (LWMNTV), which is a group that carries out volunteering with the National Trust. We volunteer all over the country, although with most tasks in the south east of England, with volunteering tasks taking place 3-4 weekends a month. I’ve been a member since 2007 and even met my husband through the group, so volunteering for the National Trust holds a special place in my heart. On this particular weekend, we were staying just outside Haslemere in the lovely Surrey Hills. The volunteer accommodation here is at Hunter Bunkhouse, which abuts Speckled Wood, accommodation for long term volunteers, a timber framed building, entirely built from local wood, mostly from the estate it is on, with thick straw bale walls. This was built with the help of volunteers, from groups like the one I belong to, working holidays and local volunteers. 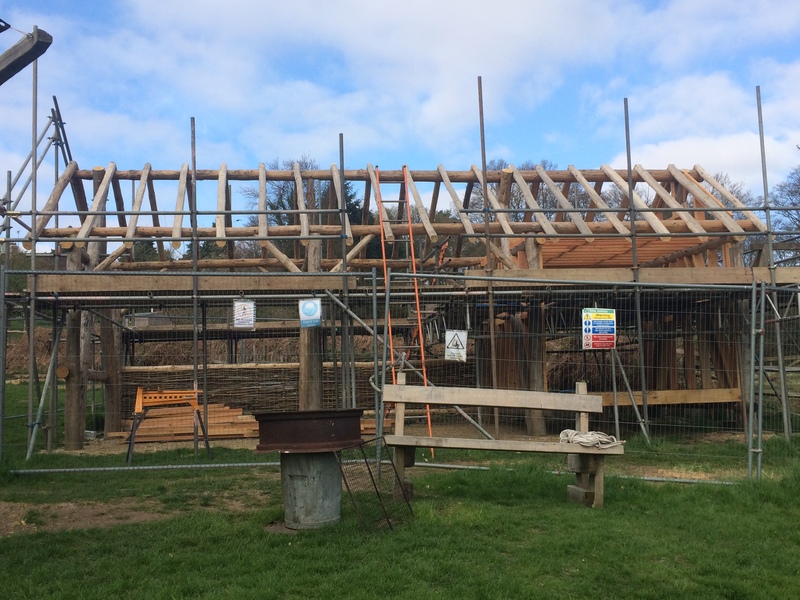 An addition to the buildings here is currently underway, to add an Orchard House, which will house the apple press and provide a store for the cider made as it ages. 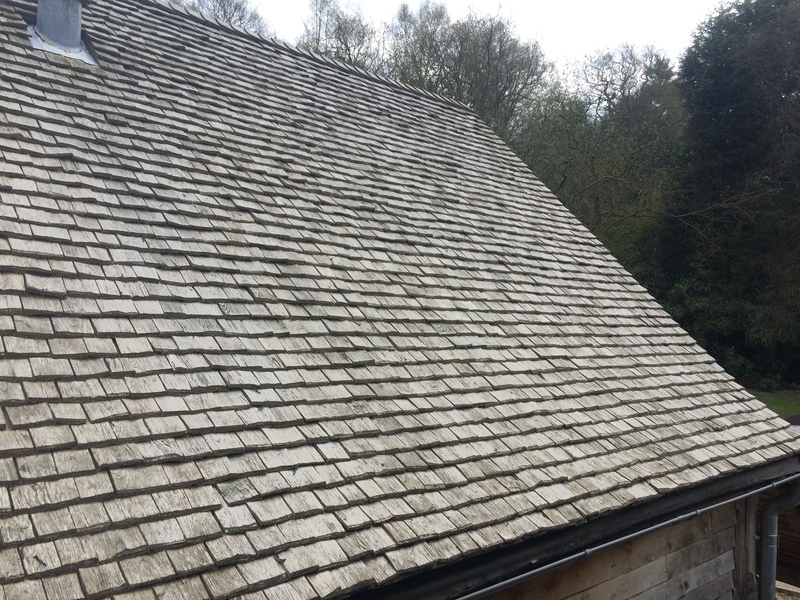 The task for the weekend was to turn locally harvested sweet chestnut into shingles, which are wooden roof tiles. The roof of Speckled Wood- the shingles we were making will make a roof like this. We were working in a woodland glade just a few minutes walk from the site. 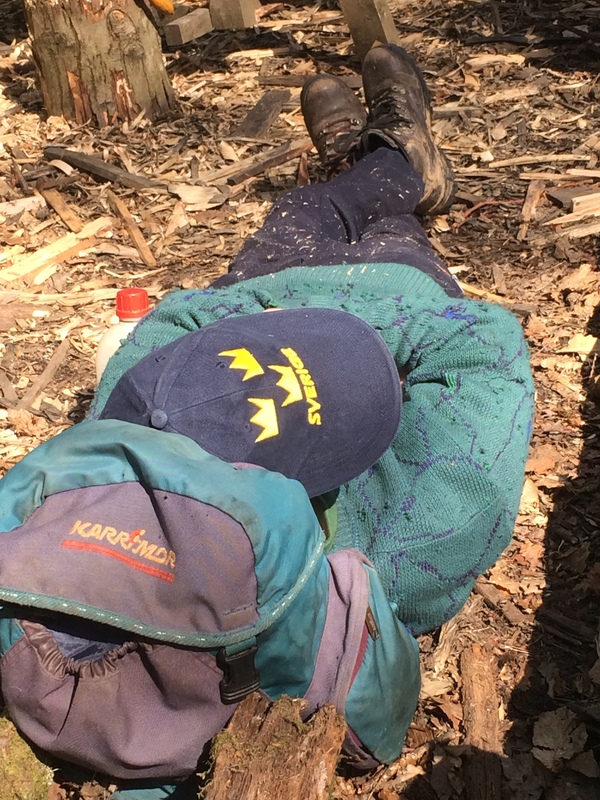 It was a beautiful spring day and I felt very lucky to be sitting with the sun on my back in the peaceful woodland, concentrating hard on a meaningful task. 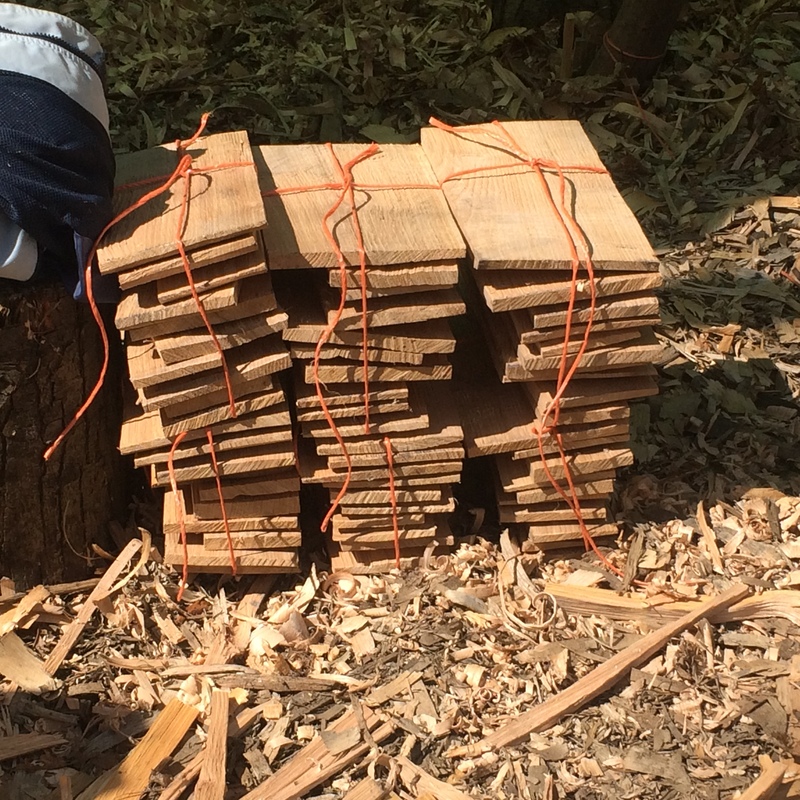 The first job was for one of our group to split the rounds of the tree’s trunk into slices and then into blanks, which the rest of us could then shape into shingles. We used wooden shave horses, which we sat on, holding the blanks of wood in front of us, gripped in place with the our feet on the boards below. 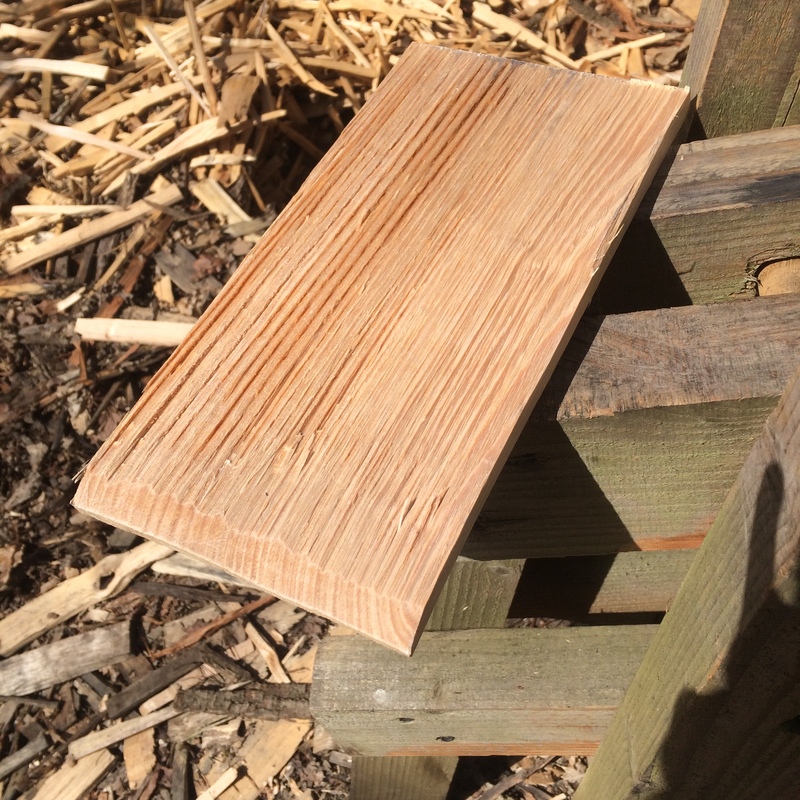 The blanks had to be shaped so that the sides were parallel and straight, with the shingle thinner on one end, which will be at the top, with other tiles layered over it, with a chamfered edge at a 45 degree angle at the other edge. Sounds easy? It’s not, but it is extremely satisfying once you’ve got the hang of it. 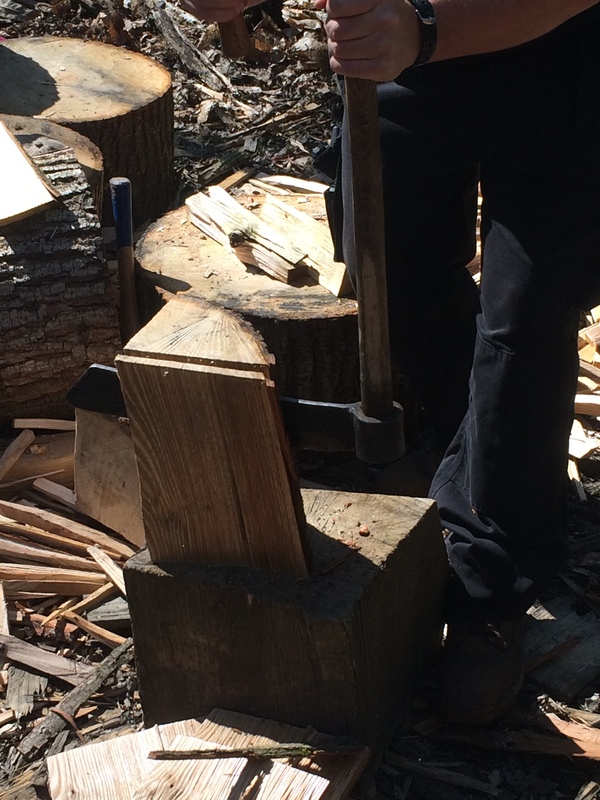 Making a shingle in the sunshine. 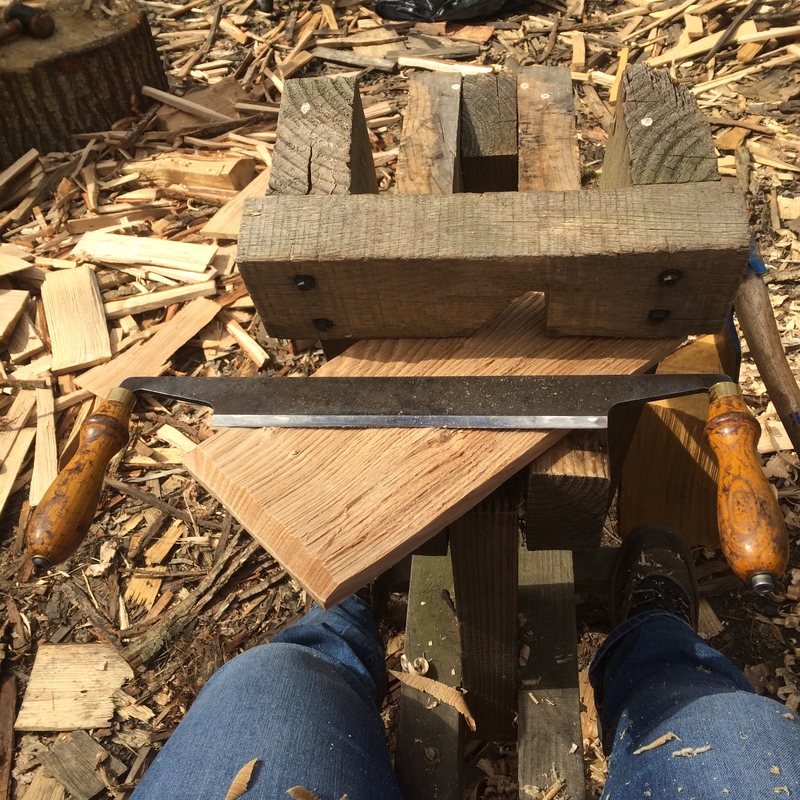 The wood felt great beneath my hands and it was great to know that I was taking part in a very old woodland activity. Between the eight of us working that weekend, we produced about 160 shingles, some of which will eventually make their way onto the roof of the Orchard House, subject to them making the grade and drying out without splitting. A completed shingle- my own handiwork. The shingles from day one. A shingle on the shave horse and the tool we were using. Volunteer resting in the sunshine, making the most of a mid morning break. The Orchard House under construction.